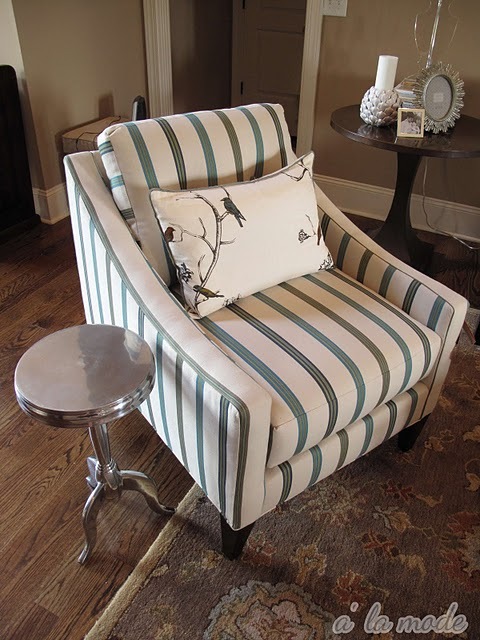 Well, my little stripey chair found his soul mate and now he is living with her in the master bedroom! I think they will be very happy there together! I love the cushion with little birds!what fabric is it? I just bought 4 yards of that fabric at Old Time Pottery for....4.99@yard. Not sure what I am going to do with it but I love it. Makes a great chair, that is for sure! Awww a match made in Heaven! :) so pretty! How perfect they are for each other and don't they look beautiful against that Baby Fawn wall! Cute chairs and love the throw pillow! How fun! We play musical furniture here too!